Few days back we went to meet a friend and on the way since we were hungry , we stop by and bought some Chicken soup and bagel from a place called Maccafe . I ate bagel and my Ka had this chicken soup, he asked me to taste the soup and it was delicious . 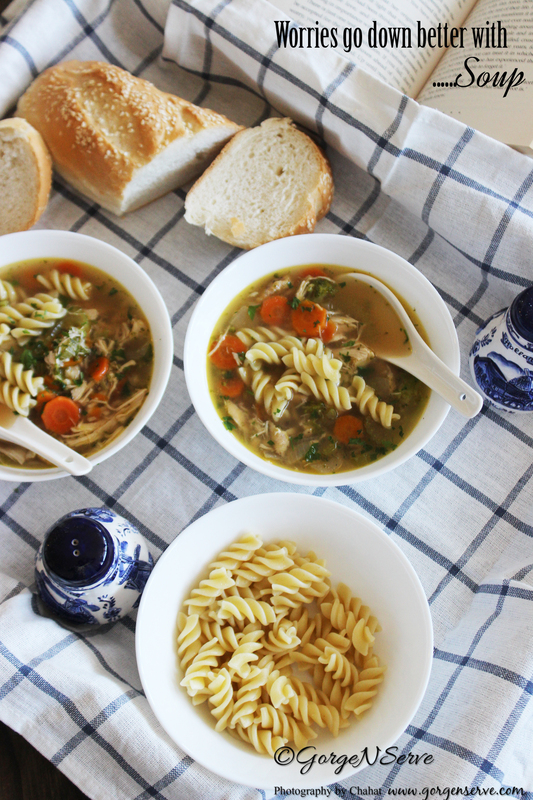 I was sick for past two days and was craving for the same soup so I decided to make it at home , googled few recipes and came up with my own 🙂 the way I want to have it .I feel like I should seriously make batches of this soup and just keep them in my freezer for the next time I’m feeling sick 😛 When I am sick I don’t feel like eating but I can drink ( not alcohol 😛 ) for sure , and this is the best dinner option. It’s light, simple, easy, delicious and super healthy. Wash the chicken nicely and pat dry with paper towel. Take a roasting pan and cover with silver foil , Drizzle a tiny bit of oil in the bottom of a roasting pan, add the chicken to the roasting pan, drizzle a little oil over the top, season with salt and pepper . Meanwhile in a large heavy duty pot, add 2 tbsp of the oil and let it heat over medium heat, add the onions, celery and carrots and season lightly with salt and pepper. Cook the veggies until softened, about 5 to 7 minutes. Add the garlic and cook for an additional 30 seconds. Now add the chicken stock, add bay leaf and sprinkle in the parsley, bring to a boil . Add the baked chicken , with any accumulated juices. Cover and bring to a simmer. Cook on a low simmer for 30 min. Meanwhile, cook pasta or noodles separately in a pot of boiling salted water, according to package directions. Drain and keep aside. To serve soup, discard bay leaf. Off heat, stir in shredded chicken and let sit until heated through, about 2 minutes. Stir in parsley and season with salt and pepper to taste if needed. 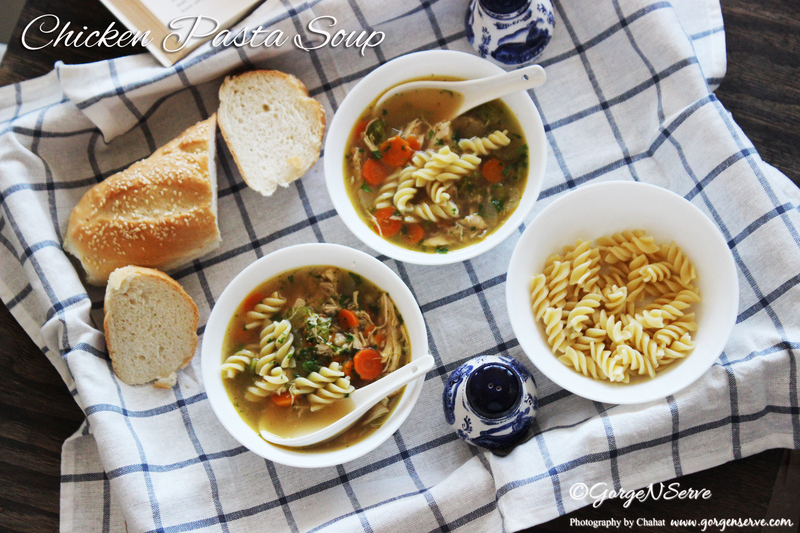 Enjoy this hearty soup with choice of your bread . 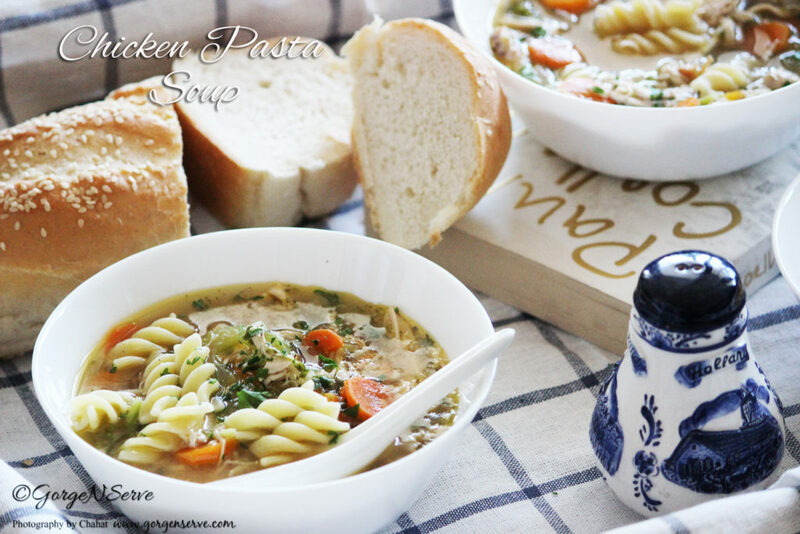 This is quick and easy to make, you won’t feel like you need to make a bigg pot of it. Just make it when you need it. 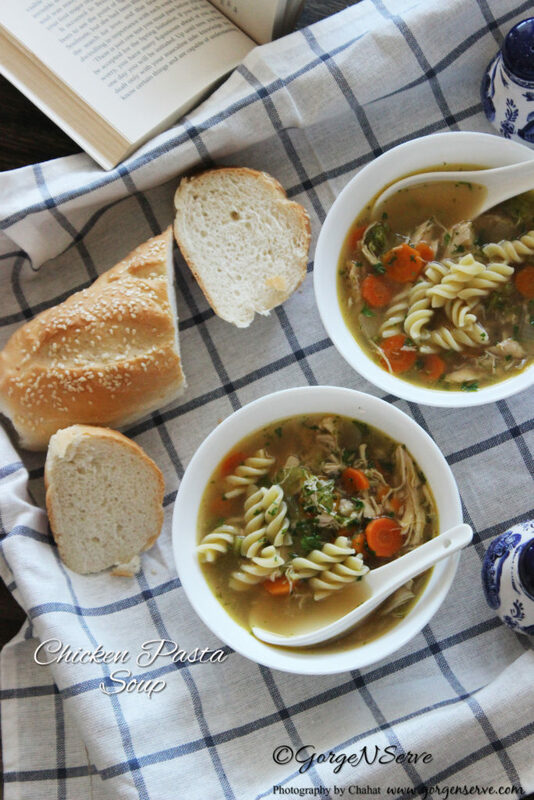 You don’t have to wait until it’s cold or sick like me to cook this chicken pasta soup. Anytime you need a little hug from the inside out, you know what to make!